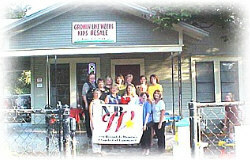 The NBWCC-New Braunfels, TX Chamber of Commerce is one of our favorite San Antonio area groups. Bailey Mullins believes that women entrepreneurs are our future and they incidentally have turned out to be some of his biggest customers and best referring customers. Nina Eastman, Manager of The Holiday Inn in New Braunfels won a "Free Car Detailing" as the official door prize of the September 2002 Luncheon. Bailey Mullins one of our top performing Texas Franchisees believes in community support of all kinds, so it is not surprising to find him helping the local area Chambers of Commerce.